The results come stomping in. See the winners here! Wow! 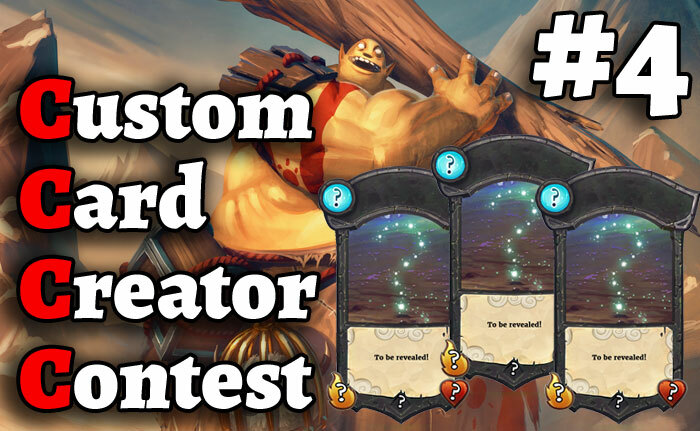 Another contest has come and gone, and I'm really happy to have you all here riding along with me! We had a couple good entries, and I can't wait to show them with you. 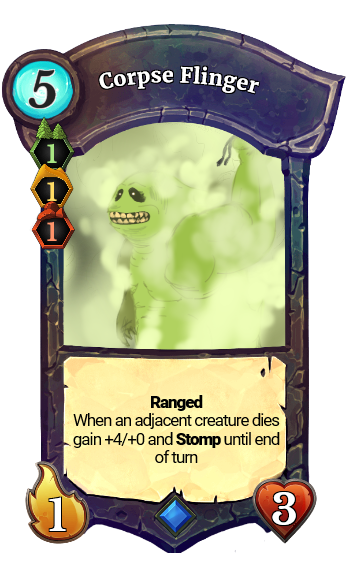 Let's recap: Stomp is a keyword that gets better the higher the stats and mobility on the creature. It destroys an enemy land when an enemy is killed by a creature with Stomp. I'd like to thank SamOvar for judging with me. He helped pick card with me. Anyways, lets stomp right through the results! I smell land ramp! You smell that, too? You can create up to five land for the cost of only 3! What a bargain, and I ain't talking about Ogres! 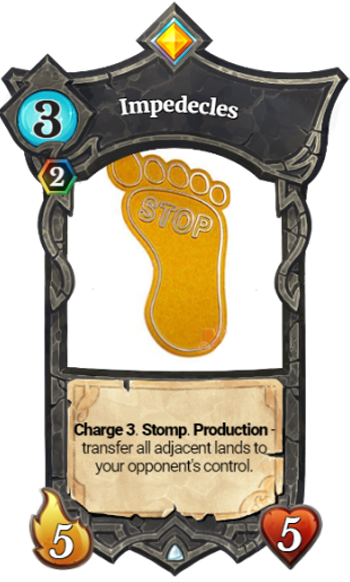 Pick your land and stomp away! 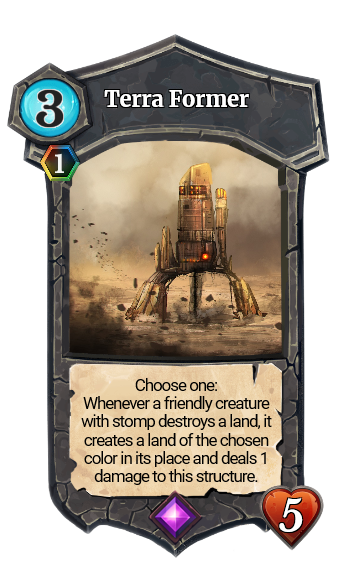 The Terra Former is offering a simple synergy with any card using Stomp and the ability to create a land just after stomping one is something we saw on a few cards this tournament. But if we couldn’t see it on a creature as it would have been too strong, we think the ability could live, be fun and balance on a structure. 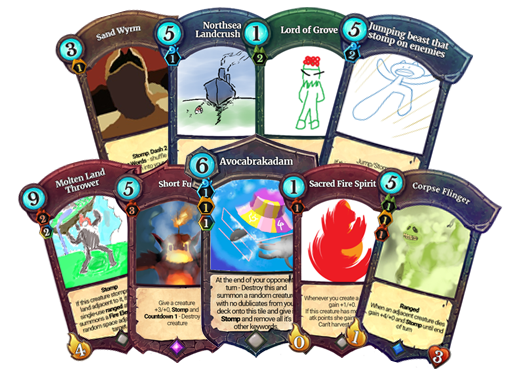 My personal opinion is I would lower both faeria cost and life to 1 faeria and 2 life as it would be too high an investment for such a contextual land creation effect. 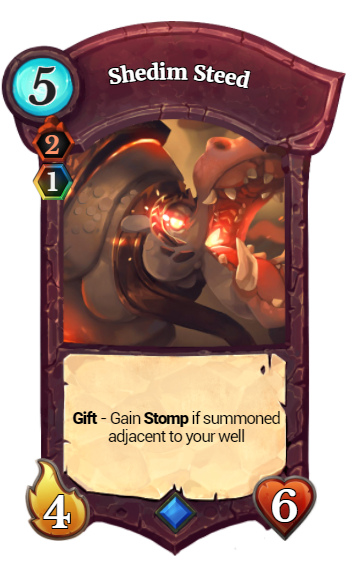 To sum it up, the usefulness of this card would be really dependant of the prevalence of the Stomp ability in the game. Nothing says stomp like little worms, am I right? You can flood the board with these little guys! They'll pop right back in to your deck, ready to decimate enemies and their lands! You only need one desert to summon them, too! Pretty sweet if you ask me! Yellow rush, are you catching this? The Sand Wyrm is a genius take on the Stomp keyword. 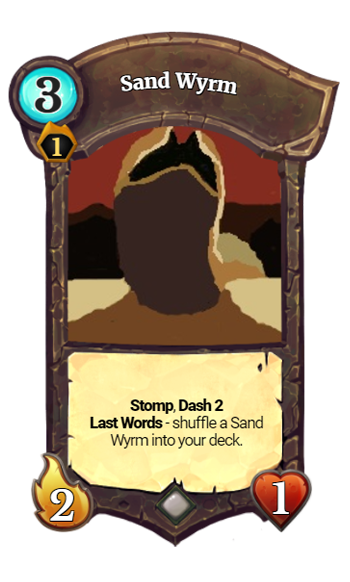 The addition of Stomp, Dash 2 and such a weak body should create an interesting puzzle for the opponent every time the Wyrm crawl from the desert. How do you kill it without losing a land or, at least, how to do it to mitigate the damages token from it ? The Last Word is interesting too but it is really hard to see how it can turn out balance-wise as it may reveal the card to be overpowered with it, or just too weak without it. Before we discuss first place, lets go over some cards that almost made the cut. 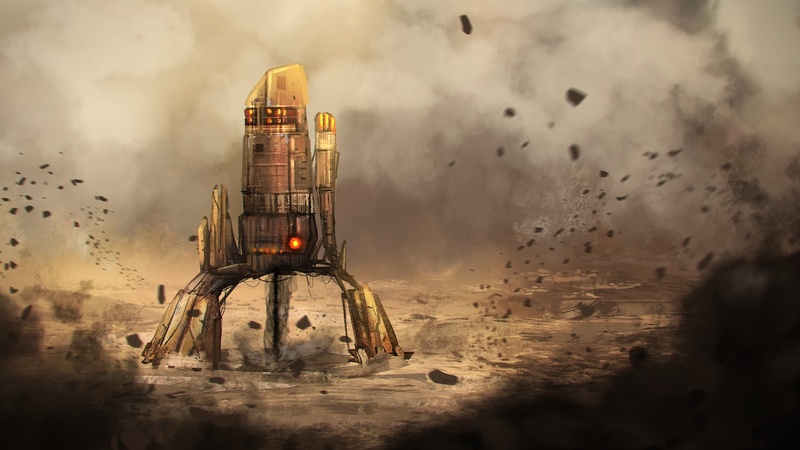 Have you ever wished to pick up dead bodies, fling the at enemies, and destroy tons of property? Well, look no further! The flavor of this card is incredible and the triple colors make it usable in a triple or quad color deck. Have fun with this card, because I know I had a fun time seeing this card pop up! The Corpse Flinger looks like a really fun card to toy with. It is really strong everytime you hit the combo and his 3 colors requirements open up a fresh new tri-color sacrifice deck. On the other hand, its ranged keyword secure for his opponent a way to counter it. But why is it number one ? I guess all these things adds up to the fact the thematic of the card is huge ! The first time I read the card, I was literally seeing it happening ! Thanks to all who participated! Congratulations to all the winners. You will receive your prizes shortly. I'm so glad you guys keep coming back to make cards for me. It makes my day when I get to see them. I'm always looking to improve, but I'm learning slowly, so bear with me. I'm tryingto make this competition as user-friendly and pleasant as possible. If you want to help me out or drop a little feedback, feel free to contact me (DeezNuggets#8176). I'd like to give a very special thank you to Atmaz and the Abrakam team for providing contest prizes. I couldn't have done this without their consent and support, so thank guys! Okay! That's it! I'll see in a couple of weeks for the next contest!